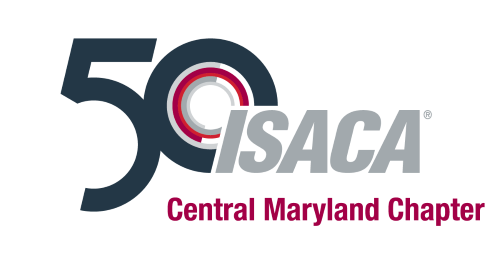 ​ISACA Central Maryland Chapter (ISACA-CMC) is led by a group of dedicated volunteers offering IT, information systems, security, and audit and financial professionals local educational events, resource sharing, advocacy, professional networking and a host of other benefits at the local level. During its fiscal years July 1st to June 30th, ISACA-CMC offers a monthly training event with 3 to 7 CPEs from September to May and one to two 2-3 day seminars during the spring and fall seasons. Unless otherwise stated, member prices for these training events are available for all ISACA, ISSA, AGA, and CFE members. In addition, retirees qualify for member prices. To gain a better understanding of the operation of our chapter and its purpose please review the ISACA By-Laws. The name of this non-union, non-profit organization shall be ISACA Central Maryland Chapter, hereinafter referred to as “Chapter”, a Chapter affiliated with the Information Systems Audit and Control Association (ISACA), hereinafter referred to as the “Association”. The Chapter, apart from its innate affiliation with the international Association, is an independent entity from any other association, enterprise, or entity. The primary purpose of the Chapter is to promote the education of individuals for the improvement and development of their capabilities relating to the auditing of, management consulting in, or direct management of the fields of IT governance, IS audit, security, control and assurance. To promote the Association’s professional certifications and IT governance. Membership in the Association is a requirement for membership in a Chapter. Therefore, upon joining the Chapter, a person must also join the Association, with accompanying rights and responsibilities. Member — Any person interested in the purpose and objectives of the Chapter as stated in Article II shall be eligible for membership in the Chapter, and the Association, subject to rules established by the Association Board. Members shall be entitled to vote and to hold office. Retired Member — Any member, who presents proof of retirement status, subject to rules established by the Association Board. Retired members shall be entitled to vote and hold office at the Chapter level. Student Member — Full time student currently enrolled in a degree program of an accredited college or university, subject to rules established by the Association Board. Student members shall be entitled to vote and hold office at the Chapter level. Meet the requirements of membership as outlined in Article III, Section 1. Complete an Association membership application form. Pay required dues to the Chapter and the Association. Follow the Code of Professional Ethics of the Association. Chapter dues shall be payable on or before 1 January of each year, in an amount determined by the Chapter Board, plus Association dues. A member whose dues are in arrears for more than 60 days shall no longer be deemed a member. A member shall forfeit membership if dues have not been paid to the Association and to the Chapter as required. Resignation — Any member who resigns shall not be entitled to a refund of his/her annual membership dues. Educational sessions of the Chapter membership shall be held at 11 yearly occurrences, in 9 monthly educational meetings and a spring and fall seminar-unless otherwise determined by the Chapter Board. The annual general meeting shall be held in May as part of that month’s educational meeting. It shall be for the purpose of electing officers, receiving reports of officers and committees, and for any other business that may arise. Special Board meetings may be called upon written request by 50 of the members. The purpose of the meeting shall be stated in the call. Regular Board meetings will occur 3 times a year. The Secretary will gather agenda items and the purpose of the meeting shall be stated in the agenda. Board decisions requiring a vote, can be made electronically in between Regular Board meetings. Electronic votes generated by Board members shall be submitted to the Secretary and the results shall be announced by the Secretary and added to Board meeting agendas for sanctioning. Electronic votes are effective on the date of the announcement of the vote results to the Board. The results of any electronic votes shall be reported in the Secretary report at the next Board meeting and documented in the Board minutes. The President provides the tiebreaking vote, if necessary. The quorum for any regular, annual general or special meeting shall be 8 members. In absence of quorum, the meeting will be adjourned, and reconvened one week later. The new date and time will be communicated to members. Members shall be notified 30 days in advance of the annual general meeting. Members shall be notified at least 10 days in advance of any regular meetings or special meetings, except in case of emergency. Notification may be by postal mail, by email or by telephone. President, Vice President, Secretary, Treasurer, and Immediate Past President. Additionally, Assistants are often on staff for the Secretary or Treasurer, these are not Chapter Officers but are members of the Standing Committee population. Academic Outreach, Advertising, Arrangements, Certification, CSX Liaison, Education, Government Regulatory Advocate, Marketing, Newsletter, Nominating, Program, Registration, Research, Webmaster, and Young Professionals. Members in the Chapter Officer and Standing Committee positions comprise the Chapter Board. Each Board member, except the Immediate Past President, shall be elected for a term of 2_year(s) and shall serve no more than two consecutive terms in the same office, or until their successors are elected and assume office, or until they resign or are removed from office, or unless it is agreed to by the Board via a vote before an election to extend the term of service. Only current ISACA members shall be eligible to be elected to the Board. No member shall hold more than 2 chapter office(s) at a time. The term of office shall begin at the close of the annual meeting at which they are elected. Past Chapter Presidents may serve as an honorary member of the Board after the term as past president expires. The position as an Honorary Board member is approved every two-years by Board vote. Each Honorary Board member shall 1) attend Board meetings, 2) vote at the discretion of Board, and 3) participate in Board business. The Chapter Board shall perform the duties prescribed by these bylaws, and the parliamentary authority adopted by the Chapter. Issuing email to speaker expressing appreciation for presentation and invitation for future presentations, if desired. If a vacancy should occur in the office of President, the vacancy shall be filled by the Vice-President. If a Chapter officer’s membership in the Association shall for any reason terminate, that individual’s position as Chapter officer shall automatically become vacant. A Nominating Committee of 3 members shall be selected by the Chapter Board at their June meeting. The Nominating Committee shall solicit candidates for office from the Chapter membership and shall nominate candidates for offices to be filled at the annual general meeting. The Nominating Committee shall report at Board meetings. Nominations from the floor shall be permitted prior to the election. Each candidate shall have consented to serve and shall have completed a Willingness to Serve agreement and Conflict of Interest form. Annual election of all Officers and Directors shall, conducted electronically in April, and announced in the May meeting. Measures will be taken to ensure electronic voting is properly conducted and that each member’s vote is only counted once. The Nominating Committee will accept nominations from February 1 through March 31. The Committee shall propose, subject to the approval of the Chapter Board of Directors, a slate of nominees (ballot) for all Chapter Officers and Directors. The ballot shall be communicated to the Chapter members by early April for voting on the Chapter website. A short biography of each nominee may be included on the website. The nominated Officers and Directors shall be elected by a plurality of the votes of the members beginning April 1 and concluding April30 on the Chapter website. Any reservations voiced concerning an elected individual shall be addressed to the Chair of the Nominating Committee. Newly elected Chapter Officers and Directors shall be installed at the May meeting of each year and shall take office at the beginning of July. Each newly elected Chapter Officer and Director shall sign and submit to the Chapter Secretary the Willingness to Serve and Conflict of Interest forms prior to taking office. The Chapter Board shall consist of the officers listed in Article V, Section 1. $750 Expenditure - The entire Chapter Board of Directors shall authorize any expenditure over $750.00, excluding payment for Monthly Chapter training and seminar speaker and food service provider invoices as well as invoices for approved special events such as annual Orioles event. $500 Expenditure - Three Chapter Board of Director members, excluding the initiator of such expense, shall approve any expenditure over $500.00. Receipts - Any Chapter expenditure will require a receipt in order to be reimbursed. The fiscal year of the Chapter shall run from July 1st to June 30th unless otherwise established by the Chapter Board. The Chapter Board shall ensure that annual financial statements are prepared, approved by the Chapter Board, presented to members at the annual general meeting, and submitted as part of the Chapter Annual Report to the Association. A majority of the Chapter Board shall constitute a quorum for any Chapter Board meeting. Section 1. A list of standing committees and duties are listed in Article V, Section 3. Other committees may be created as necessary by the Chapter Board. If dissolution of the Chapter becomes inevitable, these bylaws must be rescinded by a two-thirds (2/3) vote of the chapter membership after ten (10) days notice has been mailed to each member. In the event of dissolution, the Chapter shall notify the Chief Executive Officer of the Association, in writing, indicating the reason(s) for dissolution and shall return the Chapter charter and any other Chapter or Association documents to International Headquarters. All net assets shall be distributed to other selected ISACA chapters, or to a welfare, education, or civic project designated by the Chapter membership, pursuant to Section 501 (c) of the US Internal Revenue Code with the approval of the Association’s International President and Chief Executive Officer. Chapter bylaw amendments will be approved, at any chapter meeting, by a two-thirds (2/3) vote, provided that the amendment has been submitted in writing at the previous meeting, or has been mailed or e-mailed to the entire Chapter membership at least ten (10) days prior to the meeting at which it will be considered. The Membership Division of the Association will be advised that the Bylaw amendments have been approved, and will be sent a copy of the approved version of the Bylaws.